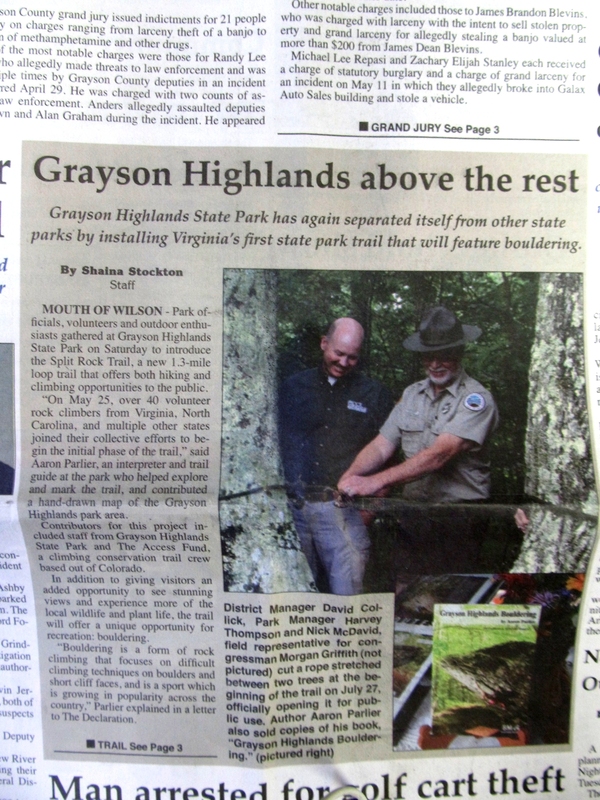 A recap of the Ribbon Cutting event for the Split Rock and Haw Flats was on the front page of The Declaration, Independence VA’s newspaper, in the July 31st Vol – No. 31 edition. It not only recapped the event but also described bouldering in the park, the guidebook, the boulderfield map, and the trail itself. 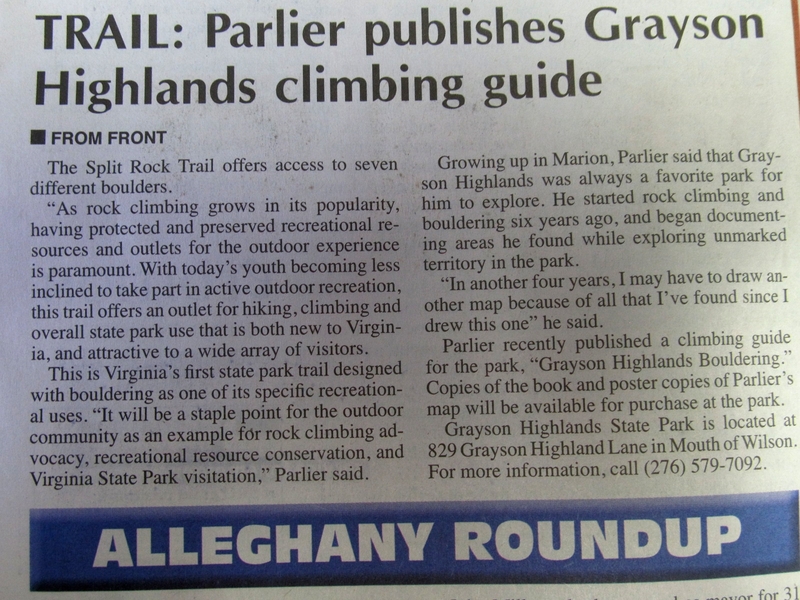 Bouldering, while gaining continual and steady popularity in America, and being embedded in many parts of the U.S. for decades, is still relatively new in Southwest VA and basically unheard of locally outside of Grayson Highlands State Park. Seeing heavily stickered cars, strange people with spongebob-like backpacks, and walking past groups of sweaty, chalk covered, sometimes bloodied people standing around the rocks has no doubt been a strange happening over the past few years. This edition of the Declaration is a great opportunity to spread the news about this new “bouldering” scene locally and to get kids near the park psyched on their close-to-home stock of big blocks. For the past two years, from the months of April-September, I have run the Bouldering 101 program for the park. This has given me the chance to teach kids in the area about bouldering safety and techniques along the Listening Rock Trail. Many of them have returned multiple times, keep track of the event schedule, and have become pretty excellent boulderers! Nearby Abingdon VA has just constructed a small bouldering wall in their high school gym, and it is my hopes that some of these kids too get psyched on their local scene. Seeing support for climbing grow from a small core of pebble wrestlers to a community wide awareness over the past several years has been a truly awesome experiance.